If you love B&Bs, quaint small historic towns, good food, excellent Texas music, antique shopping, tubin' the river, and friendly people, then pack your bags and head to Gruene Texas for a fun weekend or longer. The main reason for us heading to Gruene, besides getting out Dodge for a weekend, this late February weekend was to check out Gruene Mansion Inn and take in some good music at Gruene Hall. Gruene Mansion Inn is next door to Gruene Hall and is one of the, if not the, best B&Bs in Texas. We are not big B&B fans because we feel like we are intruding into someone's home and we've never felt real comfortable staying in a B&B. But that wasn't the case at Gruene Mansion Inn - what an outstanding place! Gruene Mansion Inn is a historic landmark situated on a tall bluff above the Guadalupe River and includes the original Gruene Mansion built in 1872 by the founder of Gruene - Henry Gruene. When the Gruene empire collapsed in the 1930's, the property was abandoned and boarded up for over 50 years. In 1970, it was purchased and converted into a 30 room B&B. The current owners Judi and Cecil Eager and their staff continue to win honors ("Top Ten Most Popular Country Inn", "Most Romantic Inn", etc.) 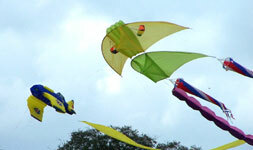 by providing a warm and friendly Texas atmosphere, gracious hospitality, and excellent facilities. Two of the 30 rooms are in the original mansion and the rest are spread out in 5 different period era buildings - so we didn't have that uncomfortable feeling of invading someone else's house. Each of the rooms is very unique, clean, comfortable, and well furnished. The rooms sleep between two and eight people and each room is decorated with rustic elegant 1870's period furniture. Our room had a downstairs trundle bed, fireplace, claw foot tub, and a spiral staircase leading to a large well decorated room with a king bed and patio. Included with the room is a scrumptious breakfast buffet (eggs, quiche, meat, potatoes, fruit, and a variety of excellent home made pastries) to help get your day started. Gruene Mansion Inn is now on Texas Outside's Best of Texas Favorites list. What a great place to stay if you're looking for a romantic weekend, a couple days tubing or exploring the area, or just want to escape and relax for a weekend. 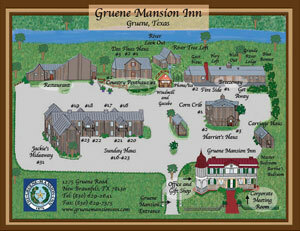 To learn more about Gruene Mansion Inn, click on their website. One of the other reasons we came to Gruene was to listen to some music at Gruene Hall, which is the oldest dance hall in Texas and right next door to Gruene Mansion Inn. In fact, you can sit on your patio and hear the music. Each weekend you'll find some of the best Texas musicians playing and having a good time at Gruene Hall. 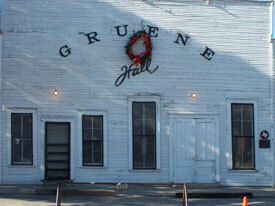 We've seen Willie Nelson, Pat Green, Jack Ingram, Roger Creager, Joe Ely, many more at Gruene. This weekend at Gruene Hall was the annual Fred Eaglesmith weekend - I know, he's a Canadian but he loves Texas and sounds like a Texan. Fred had a lot of good musicians joining him for the a 3 day music fest and BBQ. Thursday night Mark Jungers, Adam Carroll, and Mark Youngers & the Whistling Mules played. 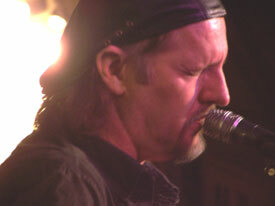 On Friday night Fred played during a BBQ dinner show and then at 8:00 the Gruene Hall doors opened and the music started with Guy Forsyth (very entertaining as he and the band sang and played a variety of instruments), then Jimmy LaFave (he is excellent!) and Fred and his band ended the evening. Saturday afternoon from 1 to 5 was free music by the Roger Marin Band and a Canadian Songwriters Show with Gordie Tentrees and Indo Saravanja. Saturday night Jesse Dayton, Sunny Sweeney, and Fred kept the crowd entertained. Friday, after another scrumptious breakfast at Gruene Mansion Inn, we rode bikes around town, went down to the river, and had lunch at Gristmill River Restaurant. Gristmill serves good food in an authentic century-old cotton gin overlooking the scenic Guadalupe River on their tree covered deck with picturesque riverbank views. And they are also right next door to Gruene Mansion Inn, as is the Gruene River Grill, another good Gruene restaurant. 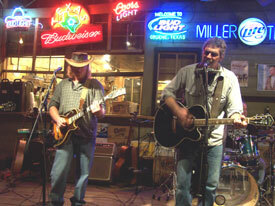 That evening we enjoyed Fred, Guy, and Joe at Gruene Hall - all three put on a great show. Saturday, we headed to Austin for the rest of the weekend. But it was impossible to pass the Tanger Outlet Mall in San Marcos without stopping and looking for a few bargains. The mall is huge with hundreds of outlet shops from top end fashions like Nieman Marcus to camping gear at Coleman's store. Make sure you grab a couple Auntie Anne's Pretzels - best get a least one per person or you'll be fighting over the last bite! While the ladies were shopping, I discovered a Paintball field just down the road so I stopped by and watched a few war games being played. 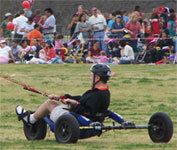 A team from outside of Texas was challenging a team from Dallas and getting ready for a National competition in Arizona. These guys really get into the game and make it look pretty exciting. 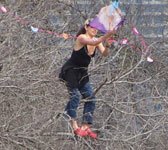 The field is open to the public, so next time you're in the area, give it a try - they rent everything that you need. Watch where you park your car, I left with a couple paintball splotches. Fun weekend, but Gruene Mansion Inn was clearly the highlight and well worth another trip to Gruene. If you're planning a trip to Gruene, here are some Texas Outside pages that you should visit to learn more about what to see and do in and around Gruene: Guide To Gruene; another Thank God For Weekends Article on exploring the area; Rockin', Rollin', and Ridin' the River; and a Guide to the Guadalupe River.